You can, quite easily. 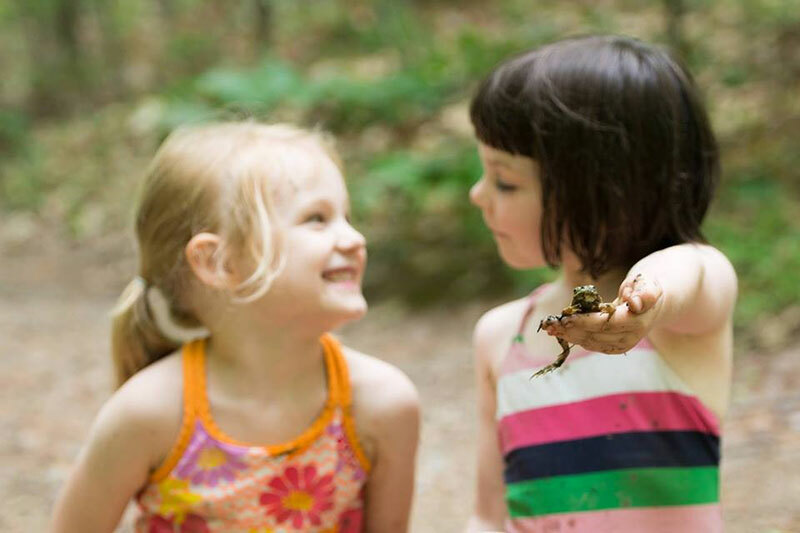 Here's how: Give your child extended periods of uninterrupted, child-directed play in nature. Not on brightly colored plastic playsets. Not as part of the travel sports team of the season. Not in adult coached or directed afterschool activities. We're talking about building forts, catching frogs, splashing in mud puddles, climbing rocks and rolling down hills. About hours spent in the woods, in fields, in all kinds of weather. Getting down and dirty. Like we did when we were kids. Things that are as foreign to today's children as life without electronic devices. 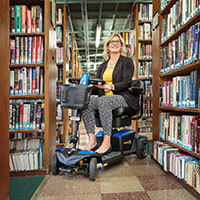 Angela Hanscom, MOT, OTR/L, is a pediatric occupational therapist, and the author of Balanced and Barefoot. 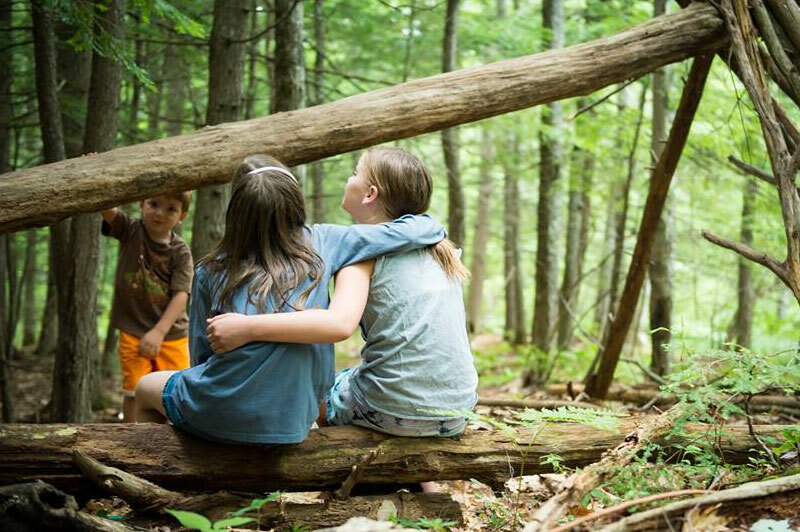 Her book shows parents and educators how unrestricted outdoor play is imperative for children's sensory, social, emotional, cognitive and mental health. Angela says, "Getting children outside, immersed in nature, and moving in the outdoors is so therapeutic. A lack of unrestricted outdoor play has contributed to many more children needing occupational therapy services for sensory processing disorders, anxiety, attention deficit disorder and cognitive disabilities." "Parents of typically developing children and those with special needs are presenting with more sensory issues than ever before. Children today have less tolerance to touch, startle at loud noises, fidget in class, and behave more aggressively than they did even twenty years ago." Hanscom is also the founder of TimberNook, an award-winning nature-based program gaining popularity in the US and abroad. "Nature is healing," Angela says. "The colors and sounds of nature offer naturally calming stimuli. 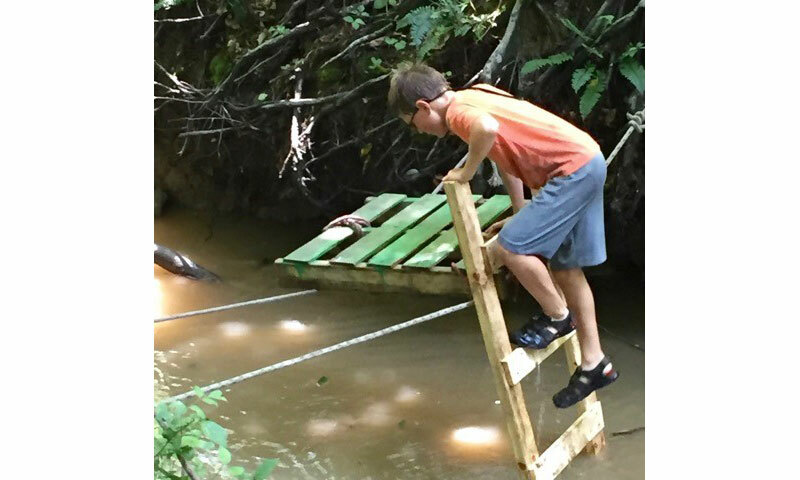 At the same time, nature challenges and integrates the senses as children navigate uneven terrain and take age-appropriate risks such as climbing trees and ancient boulders." TimberNook programs are in the woods, complete with winding creeks, fallen trees, mud puddles and rolling hills. While there, children of all abilities connect with nature, themselves and each other. Angela says that in the woods, "A fallen tree becomes a rocket ship, a boat or a plane. A stick turns into a wand, a fishing pole, a horse on which to gallop…leaves can become an ingredient for soup, a prop for art, medicine, money, décor, and so on. The possibilities are endless." Children "own" their play experiences at TimberNook. They might saw wood beams to build a fort, roll down hills and splash in mud puddles. Doing whatever they want or nothing at all. Adults are there to supervise, not direct. In addition to building fine and gross motor skills, speech skills and prosocial behaviors, children become more imaginative and more creative. This builds confidence and enhances cognition. "Through play and risk-taking, children learn about themselves. They learn about their interests, abilities and how to regulate their emotions." Angela explains, "Children learn to work through their frustrations, fear and anxiety as they successfully climb onto large rocks, as they test their limits physically and mentally each time they play. Active free play outside develops the senses, builds strong muscles and bones and fosters a healthy immune system." "There's a lot of pre-planning to get the site ready for the children to come and play. We have lots of natural loose materials such as tree cookies, rocks, planks of wood, sticks and shells." "We also have pots and pans, baskets, trays, little trinkets and costume jewelry. Pieces of fabric and translucent sheets provide a great stimulus for imaginary play." Teece Nowell, MS, LCPC, has a private mental health practice in West River, Maryland. She is also a trained TimberNook provider and offers a year-round forest kindergarten experience. "Regardless of the child's presenting problem, or diagnosis, whether it is anxiety disorder, ADD, sensory processing dysfunction, depression, anger issues—all these things melt away when children are out in nature," says Teece. While some children's anxiety or depression may be due to a chemical imbalance, which requires medication, most children, in Teece's experience, are best served by the therapy of nature. "Nature itself is healing...there's a spirituality about it…creation is natural…there's more oxygen in the woods," explains Teece. "Nature is comforting and soothing…it just naturally grounds you." 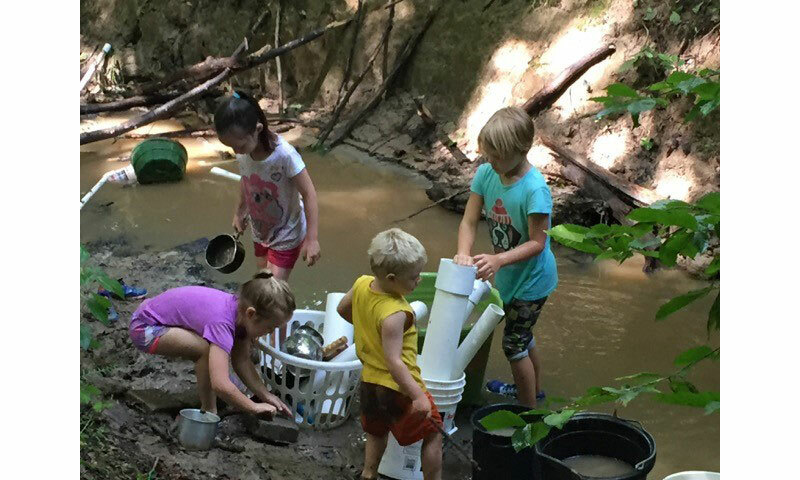 "With this natural grounding and the joy of free, unrestricted nature play, children become connected to the earth, to themselves and others in a natural way." "I've had parents tell me, 'Oh, my son will never go barefoot in the mud…never!' After 3 days at TimberNook he's knee deep in a muddy creek and I take a picture and send it to his mom. The mom is astounded. She says, 'Teece, how on earth did you get him to do that?'" Teece laughs. "I tell her that I didn't get him to do anything. It is just what happens when children get immersed in nature. The sights, the smells, the sounds, the textures…it relaxes them. It heals them." 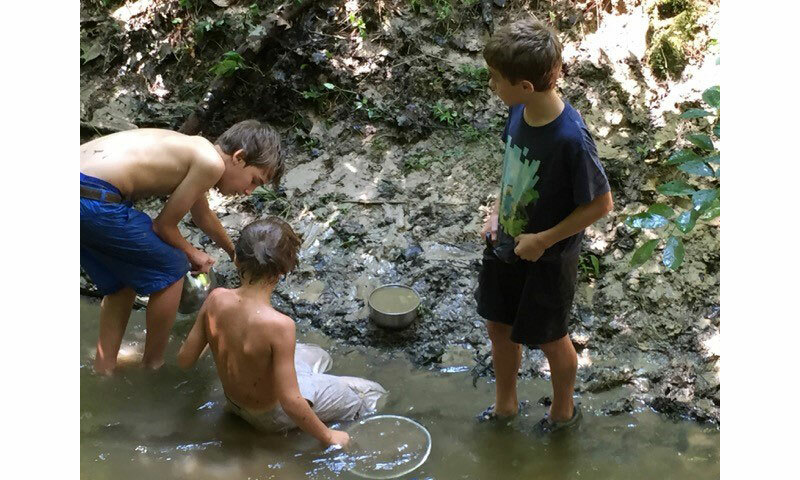 "Of course," Teece continues, "There is also the positive peer pressure of them seeing other kids splashing in the mud…climbing on the rocks. They think, 'Hey, I want to do that too!' It's all about connecting with nature, themselves and others. They feel free to take chances when play is unrestricted and the only rules are that they have to see an adult and respect each other and the environment." Brenda Richards, OTR/L, is a pediatric occupational therapist and a trained TimberNook provider in Ashtabula, Ohio. Brenda says, "Approximately 30% of the children who attend our programs have an identified special need." TimberNook appeals to all children, and especially those with disabilities like anxiety disorder, depression, autism spectrum disorders, cognitive disabilities and ADD and Oppositional Defiance Disorder, because nature is a balm for their overstimulated lives. There are no brightly colored plastic playsets, no tablets, smartphones or any electronic gadgets beeping or emitting melatonin-reducing blue light. Studies have indicated that blue light from electronic devices causes physical and mental health problems, including depression and anxiety. At TimberNook, stimulation comes from leaning back against a huge tree and seeing the blue sky above filtering through the leaves. A child feels the wind on his face and the sun warming his skin as his toes squish through mud. These sensory experiences help children work out their issues, whatever they may be, through play. Angela says, "As an occupational therapist, I know that sensory issues are huge challenges for children with special needs. For example, many children do not like light touch." Light touch is the feeling of a clothing tag touching the skin, a bug crawling on you, a feather on your arm, or things that are gooey or sticky. Light touch, for children with sensory issues often causes anxiety or the flight or fight response. "When a child is digging in the dirt, they are getting the calming deep pressure of heavy muscle work, which counteracts or voids the light touch feeling of dirt on your hands," says Angela. "We can't duplicate the therapeutic benefits of immersion in nature in any of our occupational therapy clinics. What children can accomplish in a week at TimberNook we've been unable to facilitate in a year of traditional therapy." Teece agrees. "If I could close down my private mental health therapy practice, and just treat kids outdoors in nature, I would." She laughs and adds, "And I love my practice, I love what I do, but there's no therapy practice that's as quick and as healing as being in nature." Teece shares a success story to substantiate her statement. "A little girl with a trauma background and anger issues visited my TimberNook camp. For the first three days, she didn't speak to another child. If a child spoke to her she would growl at them." "She walked with a big stick, like a walking stick, and would pound it into the ground, boom, boom, boom, with every step she took," Teece shares. "Three days later, this little girl was in the water, with the other kids, laughing and pouring water over her head." "The camp counselors were shocked. They asked me what happened. It was simple. The little girl had left the stressful events in her life behind. In nature, she found a state of calm. Even just watching the other children for those first few days…being in the woods, smelling the leaves, seeing the trees, feeling the wind in her hair…all those things calm anxiety, soothe trauma, heal a child." Angela says some children might need "baby steps" to get to the point where they are comfortable going barefoot or sticking their fingers in the mud, and that's okay. "With continued exposure to the outdoors, the textures, the smells, the grass, the mud—the children begin to tolerate the sensations." TimberNook programs are in the United States in California, Florida, Indiana, Maryland, Massachusetts, Missouri, New Hampshire, New York, North Carolina, and Ohio. New Zealand offers programs in Hawkes Bay, Christchurch and Wellington. Programs in Australia are coming soon. "Just getting your child outside is therapeutic," says Angela. "The birds tweeting helps with spatial awareness. Feeling the wind and the warmth of the sun ignites sensory receptors on the skin. All of this stimuli fine tunes their sensory awareness." Start a garden. "As you garden your child may be inspired to dig in the dirt and explore with a shovel," says Angela. Find parks that have natural elements to explore like creeks, woods, rocks and grassy areas. Rich and inspiring outdoor environments stimulate children in ways that organized play or going to a neighborhood playground, complete with plastic playsets and shredded tire mulch just can't do. Give children time outdoors. By time, Angela means several hours. She says it takes at least forty-five minutes for children to get into deep creative and meaningful play. It takes time to figure out what you are going to play and then to act out that play scheme. 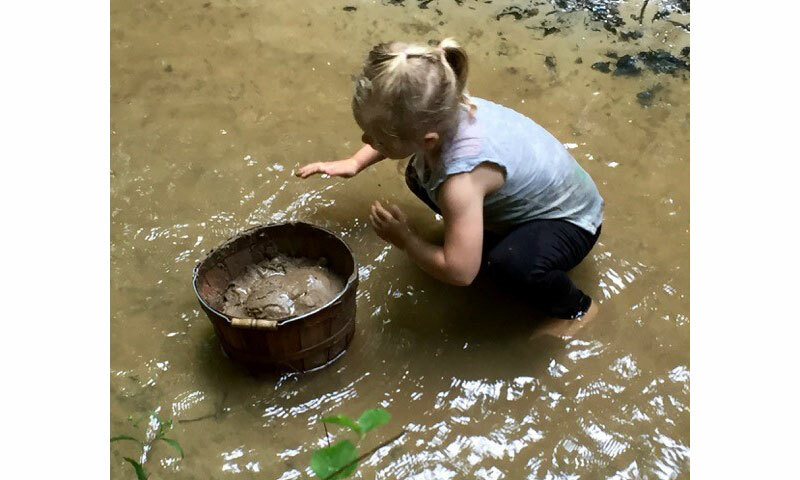 Encourage children to play in different locations: at the beach, in the woods, by the creek bed, and in mud puddles. By providing a variety of environments for play, you will continue to challenge and enrich your children's mind and body in many beneficial ways.